The Status Page displays details about your search's progress as it is being processed. The page automatically changes as SureChEMBL provides the statistics of the search. Note: When your search finishes, SureChEMBL automatically displays the search results. Result count Displays the number of hits found. Elapsed time Shows the duration of the search process. 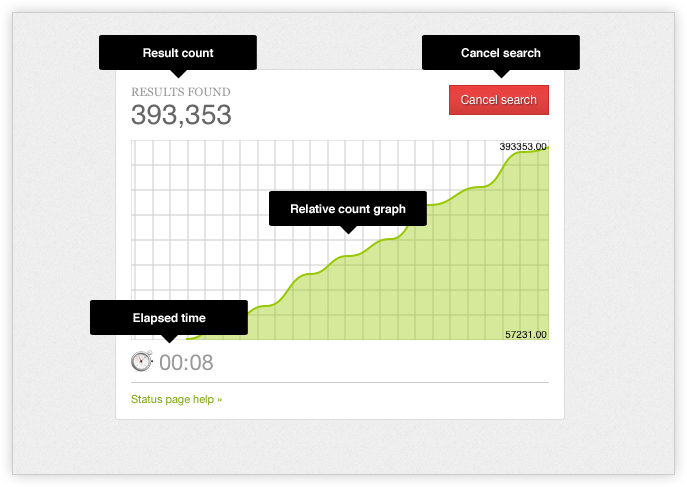 Results graph Indicates the increase of the hits count across the duration of the search. SureChEMBL stops processing the search and returns to the Search Form.